Over the last 60 years, the practice has grown from the three original founding partners into a large international firm. Today, we operate from 18 regional and associate studios in the UK, Central and Eastern Europe, Asia and the Middle East, undertaking projects worldwide. Our work has won over 250 global design awards. Chapman Taylor’s Warsaw studio, opened in September 1999, has been designing and delivering major projects across the CEE region for nearly 20 years. The studio provides a full range of services from concept design and master-planning through to permitting, tender and construction documentation, as well as on-site inspections. We offer consultancy services in strategic commercial areas such as development feasibility studies covering retail, leisure, offices, hotel planning – with particular emphasis on our expertise in regeneration of urban fabric. The firm has the resources, the range of skills and the experience to carry out successfully a wide spectrum of architectural projects through all stages from feasibility studies to completion. 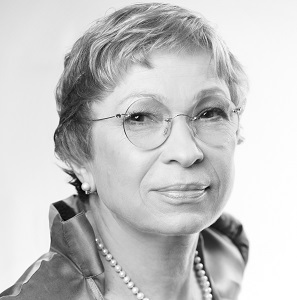 The directors – who are fully involved in every project – are supported by highly qualified staff. We have been using BIM in our work since 2008. We are proud of how the Warsaw studio has become a recognised pioneer in the use of 3D BIM technology in Poland. We have assisted the BPCC and the British Embassy in Warsaw in advocating the use of BIM in Poland, particularly since the UK mandated BIM for all buildings procured by the public sector since 2016. In the early 1990s Chapman Taylor started looking at opportunities in Poland, when we received expressions of interest from potential clients. When project opportunities in Poland became more solid, particularly a large retail and leisure project on the site of a former coal mine in central Katowice (now Silesia City Centre), a permanent base was established in Warsaw in 1999. There are two subsequent retail and leisure projects built on the sites of former coal mines, including Pogoria in Dąbrowa Górnicza and the award-winning Galeria Victoria in Wałbrzych. These were very difficult projects, logistically, built on land full of underground ‘holes’. They required clever design and innovative engineering solutions to be built and become the successful schemes they are. One of the major and unique projects we worked on was Centennial Hall in Wrocław. Originally constructed according to the plans of Max Berg in 1911-13, Centennial Hall was an early landmark of reinforced concrete architecture. As a symbol of the city of Wrocław, it was listed as a UNESCO World Heritage Site in 2006. Our work on Centennial Hall included re-arranging the interiors modifying the functional aspects and increasing seating numbers to 10,000 from previous 6,500; all within the constraints of very strict heritage requirements. Another project that we are proud of is Ethos in Warsaw. It is a prestigious mixed-use, retail and office scheme on the historic Royal Route. Chapman Taylor Warsaw was offering turnkey architectural services relating to the retail and office public spaces of the project. These included interior design and commercial advisory for the expansion and refurbishment of the existing building. Chapman Taylor’s Warsaw studio has recently completed the first phase of renovation of the Forum Gliwice, transforming the shopping centre public areas inside and out as well as bringing a modern and fresh feel to it. The refreshment of Plaza in Lublin for Klepierre Group is also completed. 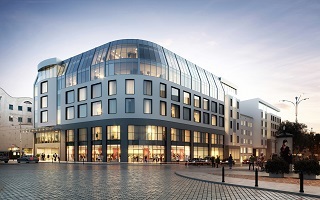 We are working on another existing retail and leisure scheme remodelling and renovation, Bemowo in Warsaw – the building permit has recently been obtained. Three fashion outlets extension projects are also in the pipeline. We are working on the interior and exterior transformation of Kupiec Poznański in the Poznań’s Old Town. The scheme will include reconfigured office and retail spaces along with a new four-star Marriott-branded hotel. Construction is scheduled to complete in 2022. 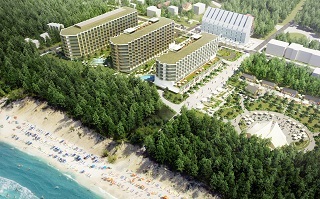 The studio is also working on a seaside resort development on Poland’s Baltic coast, which will include a four-star hotel, aparthotel and a residential building, all with access to the beach, as well as a public square, events space and associated amenities. We have been looking to diversify our capabilities quite markedly, with a view to enhancing our profile in the fields of hospitality, workplace and transportation. The studio has been working on a number of hotel designs, including the one in Poznań, and we have been liaising with the Prague studio on office designs. We have achieved a building permit for the automotive industry catalyst plant, now on site in Gliwice, on behalf of chemicals and sustainable technology specialists (FTSE 100 firm and BPCC member Johnson Matthey). We are competing for and creating concept designs for several major master-planning schemes; still early days for some of them, as they have to be subjected to various planning processes and administrative procedures. We also are looking into transportation projects in Poland, in particular the Central Transportation Hub (CPK) an ambitious multimodal multibillion project between Warsaw and Łódź announced by the Polish government. The changes taking place in the industry, including new approaches to the methods for the provision and procurement of buildings, present opportunities for services of many kinds and over a broader spectrum than in the past. This is a challenge we are pleased to accept and we have responded by providing a greater flexibility of service with the same design and management quality that has been our objective since the practice was founded in 1959.